1933. 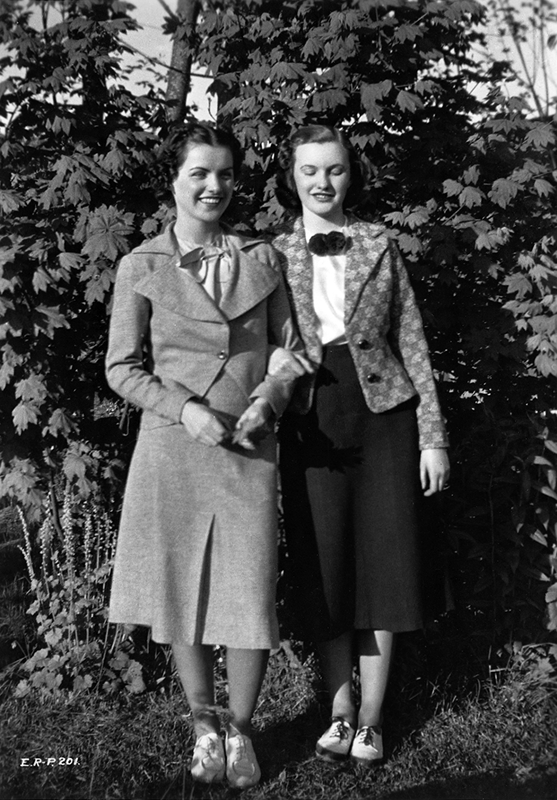 Ella Raines (right) with high-school friend, Shirley Brendan. Read more. 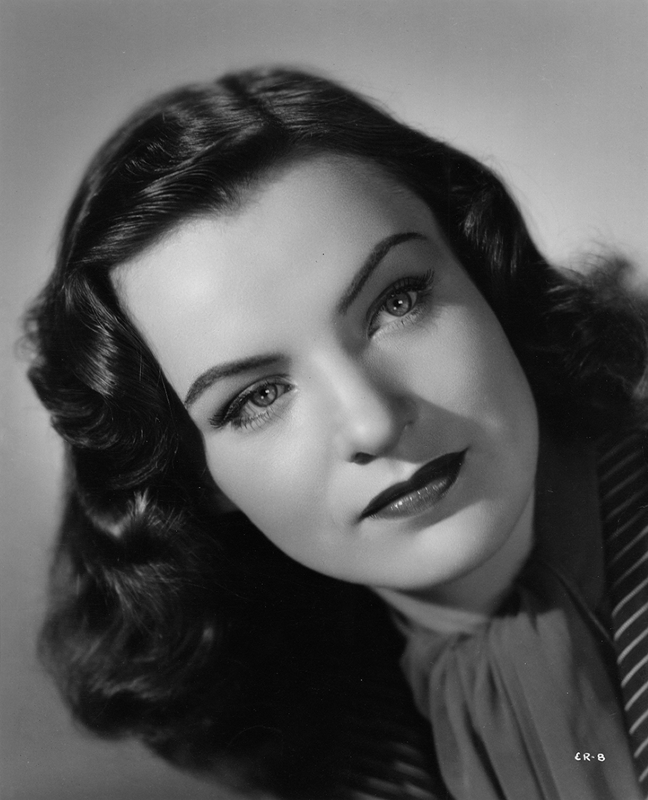 Miriam Alberta Ghidalia interviewed Ella Raines for the December 1945 issue of Screenland. It all happened very quickly. Yards of swift, strong ice ‘flying under her skates and then suddenly, a gaping mass of swirling grey water looming up at her. “Oh Lord,” she thought, “oh Lord, I’m going too fast, I can’t stop, I can’t stop!” when magically, there was a hand grabbing her arm and swinging her over to solid land, and she was crouching on the old log, hugging herself close and sobbing. “You’d think that after anybody’d lived at Snoqualmie Falls for all of their fourteen years, they’d know by now that the north side doesn’t freeze till after Christmas!” Ken’s voice was gruff and deep with his vast three-years-older superiority. Because, you see, Ella Raines’ one-track mind finally made its destination—she really married the boy! And to no one’s complete surprise. Snoqualmie Falls, Washington (pop. 752; location: 29 miles southeast of Seattle), always figured that some day Kenny Trout, who had a fine purple hatred of clinging vine girls, and pert Ella Raines would “get together.” Because it was common knowledge that when Ella’s dad got used to the idea of his first-born being a girl, he decided to ease his disappointment by giving her as many of the “manly” virtues as possible. So by the time little Ella was five, she was a swimming champ, and in another five years was joining her father in “roughing” trips to the Cascades where they hunted and fished, skied and climbed mountains, loafed and had long talks by flickering firesides or over sizzling barbecues. To this day Ella prefers the simple life, reading her beloved Shakespeare or George Bernard Shaw, composing sad, wild music on the baby grand piano she bought herself with her first movie pay-check, walking high in the Hollywood Hills where there’s no one to talk “shop” at her or babble of studio gossip. 1943. 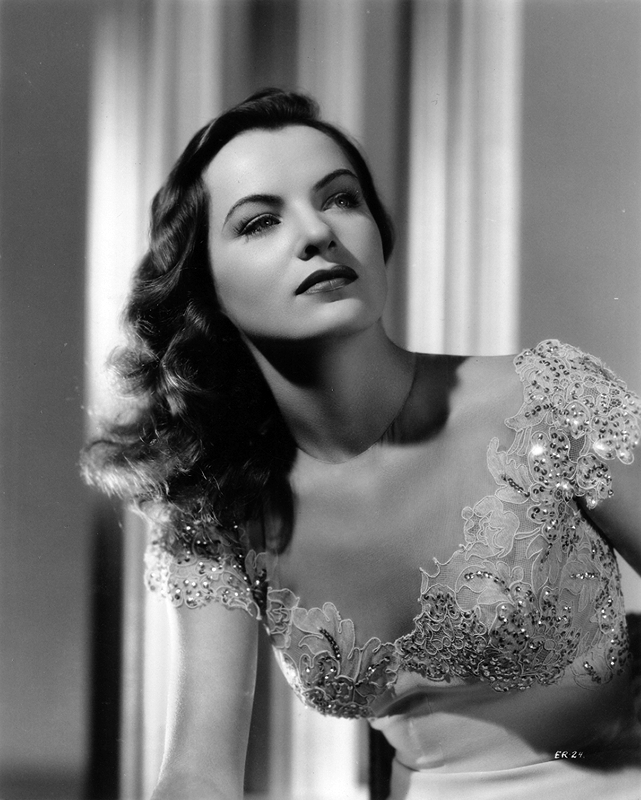 Ella Raines, the year she arrived in Hollywood. “I used to go in for flurry and bustle,” she recalls, “until I was about eight. Then Things Happened.” It was right around Christmas and there was that certain feeling in the air, that feeling that transforms all little girls into demons and all adults into avenging deities—with hair-brushes. First there was Miss Daniels’ piano recital where Ella, glowing in black patent leather and pink organdie, acknowledged the applause and head noddings of various parents, announced, “And now I will play ‘The Happy Farmer’,” spread out her fat little skirts over the piano stool—and promptly gave out with some very fine boogie-woogie! That would have been forgiven eventually, even coming as it did two days after she stuck bubble gum on the seat of the 3rd grade teacher who’d flunked her in arithmetic, but when on Christmas Eve, she interrupted the hymn singing because she spied Santa sneaking in through the vestibule—with Daddy’s pants’ legs hanging out over his red flannel suit, well . . .
She was still in high school when she made up her mind about Kenny, about becoming an actress. Mr. and Mrs. Raines couldn’t see it her way. She was too young to know her own mind, the glamor was blinding her, if she went out with other boys— So, ever obliging, Ella bought a car, a ‘29 coupe with blue lights and a lethal exhaust, boned up on her studies, and attended all the local dances where she invoked the undying hatred of all the girls and the oyster-eyed adoration of all the boys. “I suppose I was the belle of the ball,” she reasons, “because in those days fellows were always looking for laughs.” But it wouldn’t work. Kenny still had the inside track on her heart, theater on her head. And by now she was a woman, wonderfully beautiful in her strong-boned, vital way. Lush-mouthed, hair almost black, almost straight, her cheekbones high and slanty, her nose pert and unbelievable with its tilt, its zany curve. She enrolled at the University of Washington partly because it was near home, mostly because it had such a fine dramatics department. The folks still hadn’t understood or condoned when they finally consented one evening to come see her act “in a real show, ‘Spring Dance,’ “but when they saw her come onstage, with that free-swinging purr of a walk, her head high and her eyes glowing with fulfillment, they gave in—Ella was an actress. Couldn’t figure out where she got it from, no Raines ever had been one before, but they’d seen her eyes tonight. She was an actress, all right, no doubt about it. So God bless her. In her sophomore year Ella won five scholarships and opportunity gave its first timid knock. Would Miss Raines be interested in a screen test at Warner Brothers? They’d pay her fare both ways, if necessary (but with Miss Raines’ talent, beauty, wit, etc., surely the return ticket was money thrown out the window? ha-ha-ha . . .) and give her all the time she’d need to get used to Hollywood and movie making before her test came up. Two weeks later she was at the studio. A month later Ella had her test, a you-all, magnolia-blossoms-in-the-moonlight opus with long blonde curls and a powder base that by contrast would’ve made Camille look like an outfielder. 1944. Portrait of Ella Raines by Ray Jones. It was her original fairy godfather, Talent Scout Smith, who approached her with the verdict. “All right, Elly, cry it out. Sh-sh, everything’ll be all right. You’ll graduate and then you’ll marry me and we’ll- “. Ella’s no Pollyanna, but also, she’s no dope. So after she took time off to cry her ego back into shape, she went hack to school, all the more determined to become an actress. She concentrated, got to know the technique of acting instead of depending on her smile, her walk, her trick of flinging her hair back and smouldering through a role. By now Dad was just as enthused over her career as she and so pleased with her progress—in her Junior year now, she won seven more scholarships and had been elected Navy Queen and one of the U’s Cinderella Girls, meaning one of the six most attractive, talented, popular and etcetera girls on the campus—that he decided to stake her to a summer in Hollywood. To this day, nobody knows how it happened. Ella’d come home sand-gritty and dripping with sun tan oil, dying to get under a shower but also anxious to get he ham started. Impatiently, she lighted a match for the oven and ducked her lead down to make sure the flame had caught. A split second, and then torrents of pain. And through it all, nothing except the smell of flesh burning and the crackle of burnt hair. And her voice thin and hollow and insistent in the stillness. The doctors said she’d die. Or be disfigured. Six months later she was back on he campus, eight months later the bandages came off and the campus was sure she’d be all right. Because Ella was calling herself “Curly” and she had no hair or brows or lashes. Because Ella was still determined to be an actress. She flew. She married him tomorrow. So she wouldn’t get her diploma, so what! “You only live once—so love while you can,” is Ella’s motto. Maybe it was the war—but after being with him for ten years she felt her mind was made up. They had only two days in which to prepare but the wedding was done up brown with 150 formal announcements sent out and orchids and rice and people crying and a three-line notice in the local Palm Beach paper. But with Ken shipped overseas, Ella was restless, uneasy. Until Dad decided to reveal his plan: He was sending her off to New York—all expenses paid—with his blessings on a stage career. 1945. Ella Raines. Come and get me, boys. But Ella had no sooner decided on one course of action when Fate got puckish and started playing tricks again. Because instead of sticking it out at the Plaza with a box of crackers for the next year, Ella landed a bit part in that hit of hits “Oklahoma!” within three weeks of her arrival East—and immediately took to her bed with a severe attack of ptomaine! But the Lord giveth and the Lord taketh away: A friend of hers who’d learned of her illness at the same time he’d heard that Hollywood agent Charles K. Feldman was in town scouting for new talent, dispatched Mr. Feldman (properly impressed) up to the Plaza. Whereupon Mr. Feldman (still more impressed) met Miss Raines, borrowed two of her photographs and showed them to Charles Boyer and Howard Hawks who were then forming their million dollar B-H producing corporation back in Hollywood. The aforementioned gentlemen took one long look, the kind of look that comes out like a whistle, and sent a telegram. Would she like to sign a contract? She would. (Fanfare, bugles blowing.) So on February second, 1943, Ella arrived in Hollywood, February third she had a screen test. February fourth she started work on “Corvette K-225,” the picture Hawks was currently producing at Universal. A few months later, Universal couldn’t take it. They pled, threatened, cajoled, until the B-H corporation saw the light and sold them Ella’s contract outright. All this (she’d already played in M-G-M’s “Cry Havoc” and the leads in Paramount’s “Hail The Conquering Hero” and “Phantom Lady” with Franchot Tone)—and “Corvette” hadn’t even been released yet! And now with “Tall In The Saddle,” “The Suspect” and “Enter Arsene Lupin” playing the neighborhood movies, Ella’s just finished “Uncle Harry,” the show which Eva Le Gallienne made so memorable on Broadway and which those who’ve seen the movie version vow marks Ella’s final leap to stardom. But not even stardom can change the girl. Before Ken was out of the Army she lived with him in a tiny bungalow down in Miami, along with the other Army wives, living in suits and slacks, breaking up over Hope’s radio shows and anything with Bergen, showing off her Major’s decorations till he was red with embarrassment, trying to look penitent when he scolded her for feeding their cocker spaniel, Major Nugget, at the table. Nugget died a few weeks ago, which nearly broke her heart. Now that Ken is out of the Army, they live in their own, more comfortable home, in Beverly Hills. Divorce rumors spread through Hollywood after his return, but you can be certain she won’t do anything in a hurry. Neither of them will give up without trying everything, but if it does happen, you can’t blame Hollywood; it would have happened if they were just Mr. and Mrs. Kenneth Trout of Snoqualmie Falls. No, stardom can’t change the girl with the warm, wide smile and loping stride. The girl upon whom the GIs bestowed one of their most unique titles, “The Lady With The Lamps.” Otherwise known as the girl with the glint.